Ready, Set, Slide! 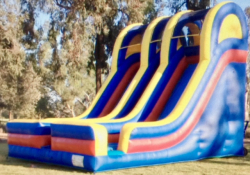 Slide Rentals from Air Bounce San Diego are an excellent addition to any party or event. Add thrill and excitement with our 24ft tall inflatable double slide! Riders will climb to the top and race down the slide, crashing into a large inflatable landing area. The side exit makes it easy for the rider to hop off and run around for another turn. Our slide rentals are great for small and large parties alike. With the double slide, your guest wont have to wait in line to get their turn. More PLAY, less waiting! An inflatable slide will have your guests laughing, playing, and seeing who can get down the slide the fastest! Great for birthdays, graduations, end of the year parties, holidays, corporate events or just a Saturday night. Add value to any order buy clicking on our our party packages! Tack on table and chairs or give your party an upgrade with a cotton candy machine to go with your slide rentals, take a look at the savings! Air Bounce is conveniently located in sunny San Diego. We pride ourselves with the cleanest equipment and the BEST prices in the area. We are fully insured and work hard to ensure a germ-free slide rental. You can count on our fully uniformed staff to be courteous, helpful and always on time. Online ordering is easier then ever, click on any image and go straight to check out, its that easy! Questions? Call 619-797-7218 or use our contact form. Our goal is 100% customer satisfaction, and with over a 1000 happy customers, we can guarantee a hassle free party experience. Order today!